Whether you want to entertain guests or just enjoy the weather, an outdoor fireplace is a great addition to your backyard! You already have your new pool installed in your backyard, but you are ready to upgrade your yard even more. What else could you possibly do to make it even better? An outdoor fireplace is the answer to that question. It is a great way to add to your beautiful yard and make it stand out even more. Here is why your backyard needs an outdoor fireplace. An outdoor fireplace is fun for people of all ages. It’s a great addition to your next summer cookout. When the sun goes down, you won’t be forced to go inside because the fireplace will give off natural light. Bonfires are a great way to get all your friends together and enjoy a nice warm evening. With an outdoor fireplace, you are no longer restricted to having outdoor functions when it is light and warm. The fire will light up the night sky so that you can enjoy the weather all night long. Even in the fall when it starts to get cold, bundling up by the fire will surely keep you warm! Now, you can entertain whenever you want to. Though it’s no grill, an outdoor fireplace is still a different and fun way to cook some food. If you don’t want to be trapped inside cooking on the stove, you can get some food together to cook by the fire. Roasting hot dogs and marshmallows is a fun activity for the whole family. Get some graham crackers and chocolate as well and make the best s’mores in your neighborhood! You can even buy a fire grate to put in your outdoor fireplace to allow you to cook full meals. You’ll get that nice charred flavor and have the opportunity to enjoy a meal in the great outdoors. Even if you aren’t big on entertaining guest, an outdoor fireplace adds a beautiful aesthetic to your backyard. It can be quite relaxing to sit by the fire after a long work day and simply unwind on your own. 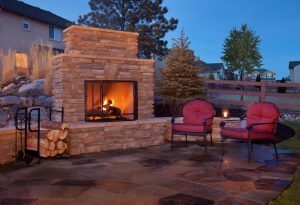 An outdoor fireplace can create a peaceful ambiance or even a romantic one if you are trying to set the mood. Whether you love entertaining or prefer to be alone, the ambiance of an outdoor fireplace will surely be worth the investment. Ready For Your Outdoor Fireplace? Call Paradise Pools Today! Whether you want an outdoor fireplace or are ready to invest in a beautifully-installed pool, Paradise Pools can complete the job. We have the expertise to walk you through every step of the process and ensure that you end up with a pool you can’t wait to take a dip in. Ready to get started designing the perfect pool for your home? Trust us with the job and be swimming in no time! For more information, contact us online or give us a call at (301) 725-0005. To get more fun pool design ideas, follow us on Facebook, Twitter, Pinterest, Google+, and Houzz. This entry was posted on Monday, March 5th, 2018 at 3:06 pm. Both comments and pings are currently closed.